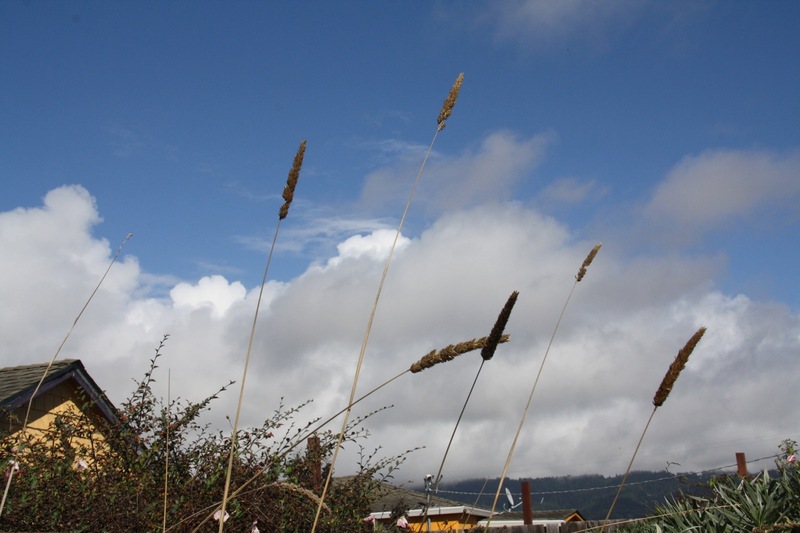 This tuft-topped weed is thriving in the roadside ditches above the ocean. 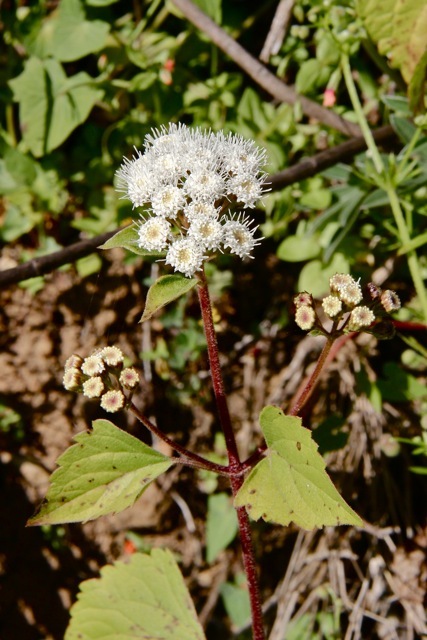 Croftonweed (Ageratina adenophora) )is an invasive, introduced from Mexico that has spread throughout California’s coast ranges. It reproduces asexually as well as through its abundant seeds, and is particularly aggressive in a coastal habitat. It’s considered a noxious weed in Asia, Australia, New Zealand and Hawaii. It was originally introduced to California as an ornamental plant. In Marin County, you can see a lot of it growing along Panoramic Highway above Stinson Beach. You’ve seen them everywhere. 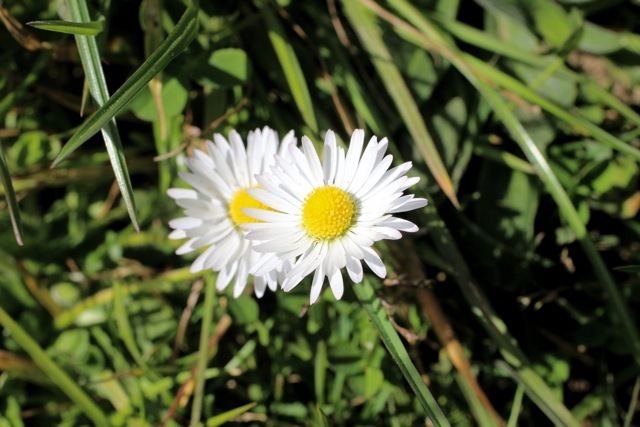 Small white daisies that dot lawns and meadows; many narrow white petals surrounding a bright yellow center. Sometimes the petals–each actually a separate ray flower–take on a purplish hue. They grow low to the ground and are perfect for daisy chains. This is English daisy (Bellis perennis), a widely naturalized species that was originally from Europe. It tends to grow in moist, grassy areas. I spotted these mounded, dark green bushes covered with yellow flowers as I drove north on Highway One. This is gorse (Ulex europaeus), a nasty invasive with yellow pea-like flowers and unpleasant spikes instead of leaves. It was introduced–perhaps deliberately–from western Europe, where I have heard that it was trimmed into hedgerows that made effective fences. Here, this invasive species is very hard to get rid of once it’s established–so if you see any getting started on your property, get rid of it right away. The killer that is laying waste to the oak trees of California is almost invisible. Sudden oak death got its name before anyone knew why the trees were dying; eventually the cause turned out to be Phytophthera ramorum. The only outward sign of infection is a dark, bleeding ooze that leaks down the bark. But a second fungus, hypoxylon, is almost always associated with the disease–this one fruits into a distinctive black growth that emerges from the bark and looks like a mound of dark, hardened foam. But inside the tree the infection is running rampant. While tanoaks and several species of oaks are the most likely to die from the disease, several other species are carriers–including redwoods, rhododendrons, and pepperwood. The spores of Phytophthera can’t travel far; they rely on the splash and flow of rainwater to carry them. But hikers, bikers, and ATVs do a much more effective job of moving the infection from place to place. It can also spread on firewood and the equipment used to do tree work. The sad truth is that even if it moves slowly, certain trees–like tanoaks–have no resistance to this disease. Once it reaches them, they will die, and someday they are almost certainly going to be locally (if not totally) extinct. It’s going to be a long day away from the computer, so this one is going to be quick & dirty (hopefully updated later). 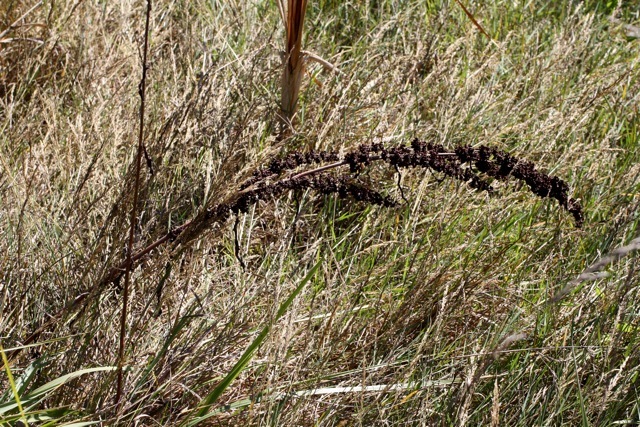 This is harding grass (Phalaris aquatica), a nasty invasive that not only takes over fields, meadows and lawns but is the bane of hay-fever sufferers’ existence. Luckily it isn’t in bloom right now, but the dried stalks can still be standing tall. A coastal bluff is carpeted with a mat of yellow daisies. The leaves are grayish green, woolly, and shaped like deeply lobed arrowheads. The flowers are bright yellow, blooming a few inches above the rosette of leaves. 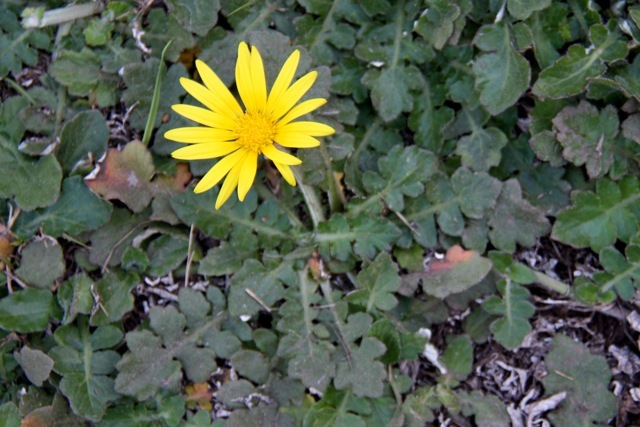 This is cape weed, or Arctotheca calendula, an invasive species introduced from South Africa. It spreads via underground stems called stolons, as well as by seed. It has often been planted as an ornamental because of its flashy flower and long blooming period, but ecologists discourage this because of its tendency to invade delicate coastal prairies. Traditionally, cape weed was considered to be one species but it is now actually identified as two separate species–the fertile Arctotheca calendula and infertile (or, rarely fertile) Arctotheca prostrata which can only reproduce via stolon and not by seed. The leaves of the infertile species, prostrate cape weed, are either entirely yellow on their underside–or they are tinted a reddish to brownish hue on the outer half of the leaf. The petals of the fertile, “standard” cape weed are a steely blue color underneath. 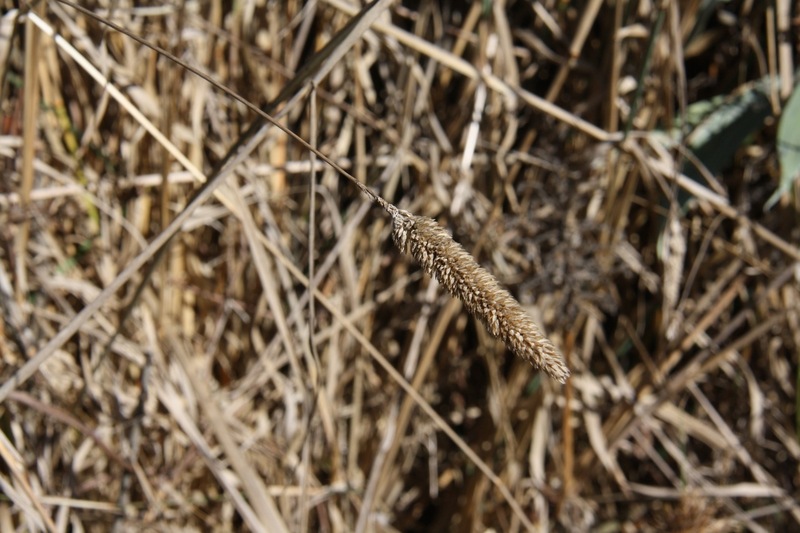 Almost all the year round you can see low green stalks studded with small red flower buds–a splash of color usually growing intermixed with grasses. This is common sheep sorrel, or Rumex acetosella, an invasive species that was introduced from Europe. It usually grows in weedy areas, and has a long bloom period from March all the way through November. The tart leaves are edible, and taste like redwood sorrel or lemongrass. Try it in salad or steep the leaves for a tea. The acidy-lemon flavor comes from oxalic acid–small doses are fine, but eating a lot of it can lock up calcium and other nutrients in your body. The root can be dried, ground and made into noodles but this seems like a lot of work and I’ve never heard of anyone actually doing it. The seeds are also edible, but they are so tiny that they also aren’t practical as anything other than a novelty. 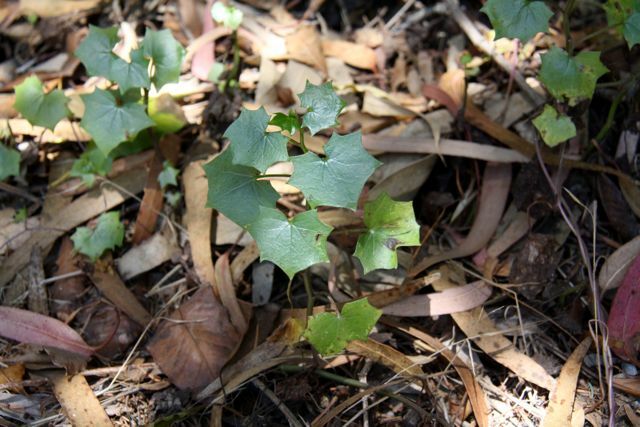 Vines with shiny green leaves–roundish yet spiked with points–grow on a forested bank. This is German ivy, or Delairea odorata, a South African native that is a problematic invasive here in California. It can smother trunks, shrubs and ground cover with its vigorous stems. It is also known as cape ivy, and is unrelated to the vaguely similar-looking English ivy. Dock is a striking roadside sight, especially now as it is in fruit or beginning to die. 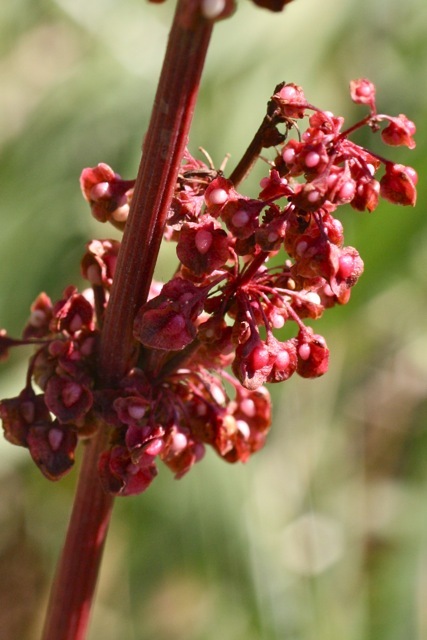 The tall stalks of red or dark brown stand out in bold contrast to the dry grasses they often grow in. Curly dock likes to grow in damp areas that have standing water in the winter. I had a lot of trouble telling curly dock (Rumex crispus) from Western dock (Rumex occidentalis) using my key. But I am now pretty sure that I’ve figured out a good seat-of-the-pants way to tell them apart: look at the tiny fan-like fruit. Curly dock, shown here, has a little nub at the center of every one–sort of like a baseball lodged in a mitt (see the photo above). Western dock looks more like a reddish leaf with a thickened vein at the center. Young leaves are edible in small quantities, and have high levels of oxalic acid which give it a lemony flavor (like redwood sorrel). Eating it may aggravate people with rheumatism, arthritis, gout, or kidney stones so be careful! It also can be used as a gentle laxative.